The limited-release of Space Hulk happened way back in 2009, and it took me a while to paint all of the miniatures for it, and even longer to play some games, and now, four years after its release, I have a battle report for it. For this battle report Badelaire and I decided to start from the beginning and do the first mission, Suicide Mission. Badelaire would command the Blood Angels while I would command the Genestealers. Space Marines: The Space Marine player has one squad. 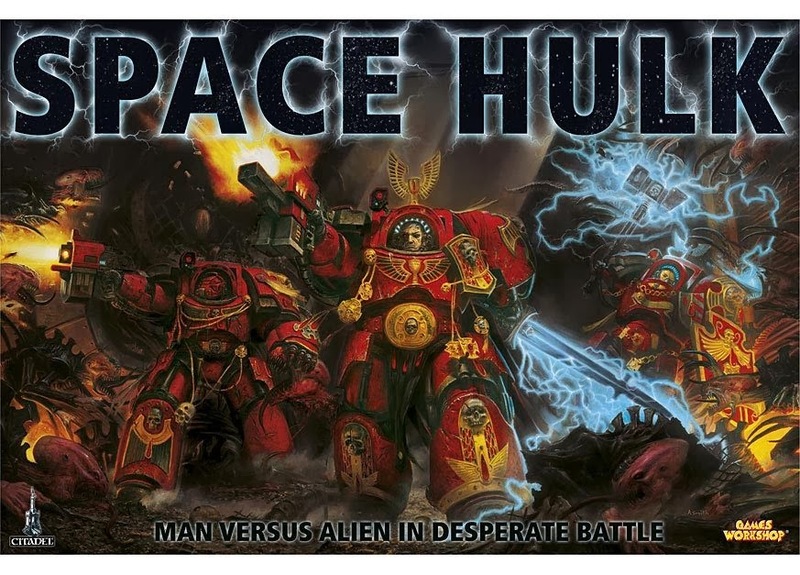 It consists of a Sergeant armed with a storm bolter and power sword, one Space Marine armed with a heavy flamer and power fist, and three Space Marines armed with storm bolters and power fists. The Space Marine player depolys the squad on the starting squares shown on the map. Genestealers: The Genestealer player begins the mission with two blips, and receives two reinforcement blips per turn. Blips may enter play at any entry area. Space Marines: The Space Marine player wins by firing the flamer at any square in the Launch Control Room. When this happens the game ends and the Space Marines win immediately. 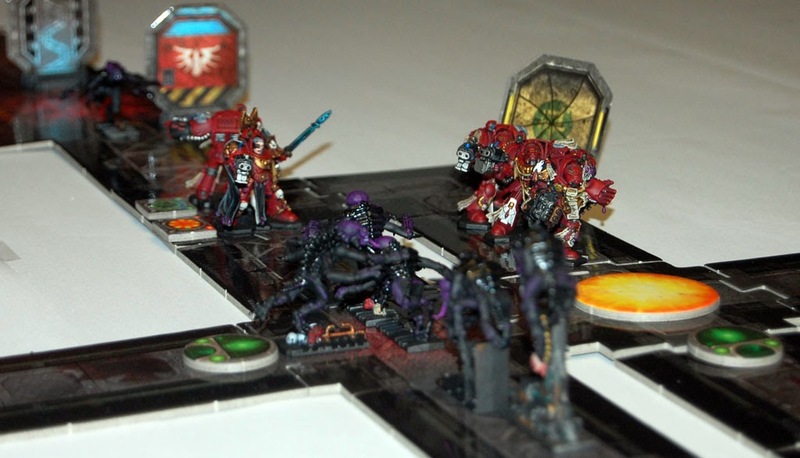 Genestealers: The Genestealer player wins the moment he kills the Space Marine armed with the heavy flamer, or if the flamer runs out of ammunition before firing into the Launch Control Room. 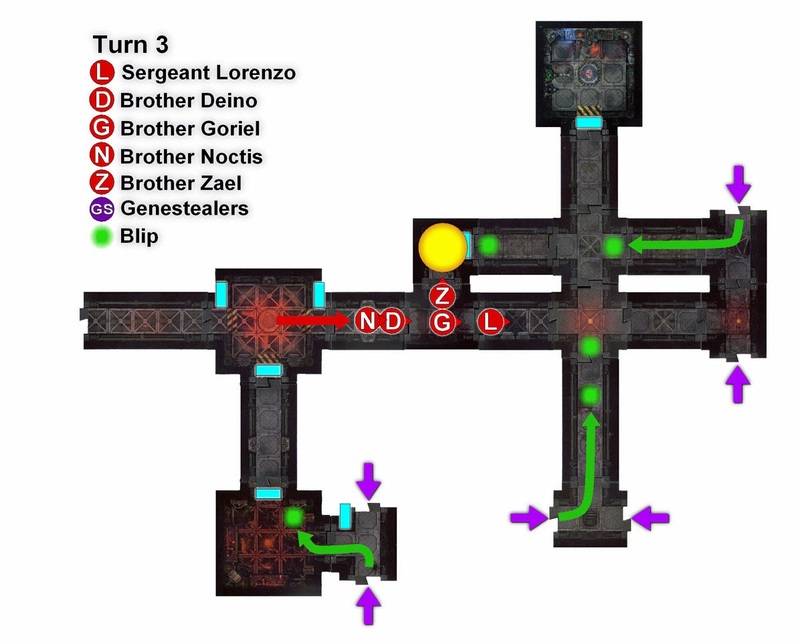 Deployment is shown above, with the Space Marines represented by the red circles, and the Genestealer entry points marked with the purple arrows. The Space Marines must get to the Launch Control Room (marked with the green square) and immolate it with the heavy flamer before being overrun by the genestealers. Sergeant Lorenzo commanded the squad, and would be taking point. Brother Zael, with his vital heavy flamer, was next. The squad was rounded out by Brothers Goriel, Deino, and Noctis. Lorenzo’s strategy was to get Brother Zael to the lifeboat control room as fast as possible, as the genestealers would be closing on their location fast. The genestealers began to appear on their scopes ahead moving to intercept the marines. Lorenzo plowed ahead, opening doors to clear the way. Sergeant Lorenzo continued to advance, firing his storm bolter down the corridor, killing a pair of genestealers at long range. The rest of the squad moved up behind. More blips appeared, one of which was making a move to get behind the marines. Reaching an intersection, Sergeant Lorenzo moved to cover the path ahead, going on overwatch. Blips began to pile up around the corners, as if sensing his presence and unwilling to expose themselves to his fire. Detecting a blip on the far side of a nearby door, Brother Zael hosed down the nearby corner with his heavy flamer, blocking the path for the genestealers should they decide to attack. The rest of the squad continued to advance close behind. With more blips arriving, Zael’s progress would be significantly slowed should he have to continue to flame his way forward. Sergeant Lorenzo held his position, waiting on overwatch for genestealers that simply would not appear. Brother Zael boldly turned the corner and opened the door, revealing a genestealer eager to attack him. Instead the genestealer got a face-full of promethium. Brother Goriel moved up behind Brother Zael, Brother Deino close behind. Brother Noctis began to turn to face the blip that had sneaked up behind the squad. The situation was becoming critical. Brother Zael was getting close, but the genestealers were piling up fast. To the rear Brother Noctis turned to face down the corridor, and spotted three genestealers scuttling at high speed up the corridor. Opening fire, he killed a pair of them, and then a third while on overwatch. A blip was still lurking around the corner, so Brother Noctis held his position. To the front, the genestealers charged Sergeant Lorenzo. On overwatch, Lorenzo was ready, and killed the first genestealer to show itself. As he fired at the second, his storm bolter suddenly jammed. This was the opportunity the genestealers were waiting for. They piled up the corridor as Lorenzo gave readied his power sword. The first genestealer slipped past his guard and drove its claws into his exposed face, and just like that the sergeant was dead. In the other corridor, Brother Zael continued to advance up the corridor, firing his heavy flamer yet again, killing another genestealer. It was going to be tight, as the genestealer blips were piling up fast, and Brother Zael was going to face some serious target saturation. Brother Noctis turned around when he heard Sergeant Lorenzo die, and prepared himself to avenge his Sergeant. He advanced into the intersection, and found himself facing a horde of genestealers. He crushed the skull of the first genestealer with his powerfist, but then was swarmed under by them, torn limb from limb. Brother Zael ran around the corner, heading towards the control room. He got as far as the door but no farther. Behind him, Brother Goriel bravely stepped into the intersection, bravely awaiting all comers, vowing to buy Brother Zael time with his life. The genestealers launched their attack. One attacked Goriel from his vulnerable side, but Goriel barely managed to knock aside the genestealer’s claws with his storm bolter. Turning to face his attacker, Goriel could not stop the follow-up attack and was killed. As Goriel fell and the genestealer leapt past him on his way to Brother Zael, Brother Deino opened up on overwatch. His aim was off, and the genestealer made it past and scuttled up behind Brother Zael. Brother Deino saw hordes of more genestealers charging up the corridor, and continued to fire, bolter shells pinging off the walls. When he was done, five more genestealers were killed and the corridor was clear. But it might not be enough, as a single genestealer had made it past his line of fire. Brother Zael had made it to the door, but he could sense the genestealer behind him. But Goriel’s valiant defense had given Zael just enough time. The genestealer couldn’t reach him in time, and Brother Zael opened the door and flamed the control room, successfully completing the mission. 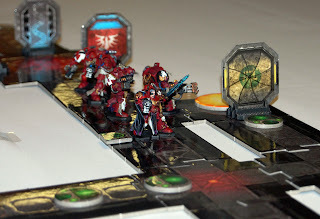 Thanks for posting the battle report! It was a real nail-biter of a mission, doubly so because I'd had so little experience playing SH to begin with. D'you know, I only ever once played Space Hulk - the original - 20-ish years ago, and I've wanted to play it again ever since. Thanks so much for the chance to do so vicariously, mate: great report!